So, we must resort to analogy and metaphor, whether visual or mathematical. The most famous analogy is the “rubber sheet”, as seen (sorta) in the xkcd comic above. In this view, spacetime is a soft stretchy surface, into which masses sink. Particles of matter and light are like balls rolling on that surface, so that they roll toward masses, emulating the attractive force of gravity. Part of the problem with the rubber sheet metaphor is that it requires gravity in the world of the rubber sheet to work: nothing sinks in or rolls properly without gravity to provide a “down” direction (which doesn’t really correspond to anything in spacetime). Don’t get me wrong: it’s a useful analogy, and I’ve used it when teaching general relativity. However, it has more serious flaws, to the point that I generally prefer other metaphors. One flaw is that the rubber sheet analogy is that it’s difficult to represent many real gravitational systems, including rotating objects like spinning black holes — or the expanding Universe. For those purposes, I like another: the “flowing current” or “moving sidewalk” analogy. In the current metaphor, spacetime itself flows, carrying objects with it. A massive body like a black hole acts like a drain, an endpoint for the current. 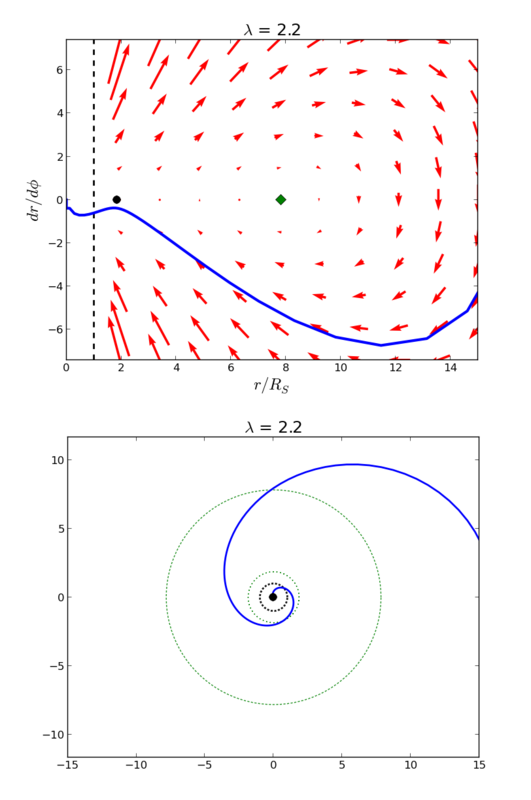 A spinning body (assuming it’s rotating quickly enough) will produce currents like a whirlpool. Particles of matter and light move on top of that current; depending on the rate of flow, it can either be ignored (objects moving far from stars) or can dominate over the particle’s intrinsic motion. The latter happens near a black hole: everything is carried by the ever-faster current, until it would require moving faster than the speed of light to escape. At the event horizon, the current moves at light speed, dragging everything along with it. This metaphor has its own flaws as well: motion is still occurring in two dimensions instead of three, and gravitational interactions between multiple bodies (binary black holes, for example) are still challenging to represent. However, it replaces the fairly static view of spacetime in the rubber-sheet analogy with a dynamic one, and it works for regular ol’ Newtonian gravity too. “But Matthew,” you say. “This is too vague!” Fear not, dear reader! How about an example? Consider the very first “real” solution in general relativity: the so-called Schwarzschild or “point-mass” solution. (I love the German term for this: Massenpunkt. It makes me think of a heavy punk rocker.) This solution describes spacetime surrounding a spherical mass that’s smaller than the orbits of anything around it, so depending on circumstances it can describe the Sun, Earth, or a non-rotating black hole. For the black hole case, Schwarzschild solution includes the event horizon: a special distance from the point-mass. If any object strays closer to the black hole than that distance, it can never return to the outside Universe, and inevitably must land on the point-mass. However, despite black holes’ fearsome reputation, drifting into the event horizon isn’t inevitable. The current of gravity flows in toward the black hole, but most things won’t be aimed directly into the maw. If an object has tangential motion — motion aimed anywhere but directly at the black hole — it has a very good chance of either falling into orbit or being flung far out into space again. To illustrate this, let’s consider a slightly different way of looking at black holes. We’ll plot the distance from the black hole (the radius) against how quickly the object is moving toward or away. This creates something known as a phase portrait of the black hole. Guide to phase portraits. If a black hole is non-rotating, it looks the same no matter what angle you view it, so we only need to worry about the distance from the black hole. That’s the horizontal axis: the left edge is the black hole itself, while the farther you go right, the farther from the black hole you are. The vertical axis is a measure of how much the object is moving toward (upper half) or away from (lower half) the black hole. 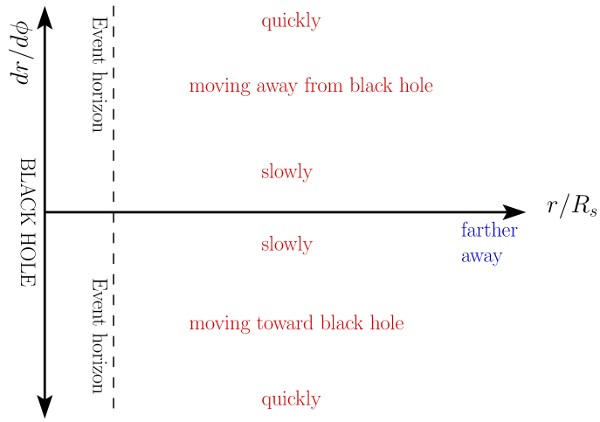 The event horizon of the black hole is represented by the black dotted line, which is vertical in the phase portrait. As it turns out, for massive particle we have only one free quantity that matters for this setup: how much orbital momentum the object has. (We’ll look at photons in a future blog post.) We’ll label that quantity λ, the Greek letter lambda, which is just a positive number. (For the expert readers, I’ll define it precisely in a technical appendix.) Big λ means a large amount of orbital momentum, while small λ means less. Zero λ is extraordinarily unlikely: that would probably mean you deliberately aimed something straight at the black hole. For Earth’s orbit around the Sun, λ is approximately a billion: 109, obviously a very large number. As it turns out, there’s a special value of λ, approximately equal to 1.7 (or the square root of 3, if you want to be more precise). Less than that value, there are no stable trajectories orbiting the black hole! Gravity will always pull an object in if it gets too close. However, if it has enough velocity headed away from the black hole — meaning, it starts high up on the vertical axis in the phase portrait below — it can escape, so long as it starts outside the event horizon. The top image is the phase portrait of an object orbiting a black hole with too little orbital momentum. The event horizon is the dotted circle in the bottom figure, which shows the actual orbit we’d see if we were observing. The red arrows represent the current: the flow of spacetime as created by the black hole’s gravity. More than 1.7 and two types of orbit exist: one stable (marked by the green diamond) farther out from the black hole, and one unstable (the black circle) closer in. (This split in behavior is known as a bifurcation.) If an object has precisely the right combination of orbital momentum and no inward or outward velocity, it can fall into a circular orbit at either of these distances. However, the green diamond is a point of stability: objects starting nearby will follow nearly elliptical orbits, which is what we see for planets in the Solar System and stars orbiting the black hole at the center of the Milky Way. 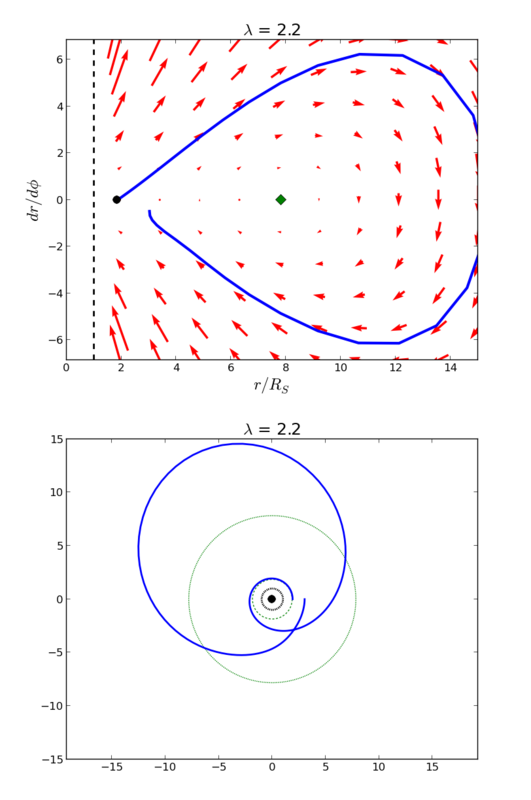 If the orbital momentum is large enough, objects can orbit the black hole in stable patterns. Here we have an object that starts at the same position as above, but it has enough orbital momentum to make it fall into a nearly elliptical orbit. In the phase diagram, this takes the shape of a squashed loop around the green diamond; in the real orbital image, it forms a Spirograph pattern, a “precessing” ellipse that doesn’t repeat itself on each orbit. It’s not a perfect ellipse, though: the path doesn’t completely repeat itself, forming a Spirograph pattern. That’s called precession of the perihelion in the Solar System, and its measurement on the planet Mercury provided one of the first precision tests of general relativity. The reason for precession is that relativity adds a small extra attractive force of gravity, an additional current that’s very strong close to the Sun or black hole, but falls off rapidly at larger distances until it’s virtually undetectable. That extra tiny bit is enough to curve a planet’s path just a little bit more than what is predicted by Newtonian physics, but near a black hole it can be a pretty large effect, like we see in the plots above. 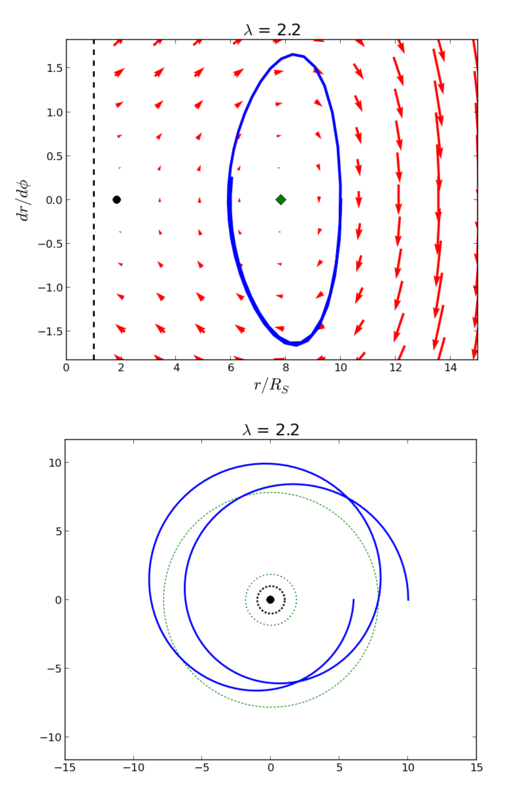 The unstable circular orbit, however, is like riding a bicycle on a tightrope: a slight disturbance will either send the object into a large eccentric orbit (as seen below) or crashing into the black hole. The black dot on the phase portrait represents an unstable circular orbit. If an object starts near that orbit but not quite on it, it will fall into a very different orbital pattern. However, just because stable orbits exist doesn’t mean that nothing will fall into the black hole if it just has enough orbital momentum. The key is that it needs enough orbital momentum and to start close enough to the black hole. Otherwise, as it plunges closer and closer, the flow of the current will drag it in. Even though the object starts with the same orbital momentum, it’s far enough away from the black hole that as the current carries it slowly in, it doesn’t have enough oomph to escape again. I could keep this up for a long time, but suffice to say that Earth has a very large orbital momentum and orbits close to the corresponding stable circular orbit value. The same thing applies for all the planets in the Solar System. The orbital distances are also much larger than the Sun’s Schwarzschild radius of 3 kilometers, which lies deep within the Sun’s surface anyway. I hope this explanation makes sense to you! I will continue the series with a discussion of rotating black holes and the fun that happens in that case, and conclude with the behavior of photons near both rotating and non-rotating black holes. This appendix is intended for people who know a little about general relativity and aren’t afraid of math, so you can safely skip it if you don’t need to know it! where we’re using the usual versions of spherical coordinates. The mass of the star or black hole is m, but it’s convenient for us to rescale everything to get rid of the physical constants G and c.
Since we’re interested in orbital motion, we’ll use the derivative with respect to angle instead of time. 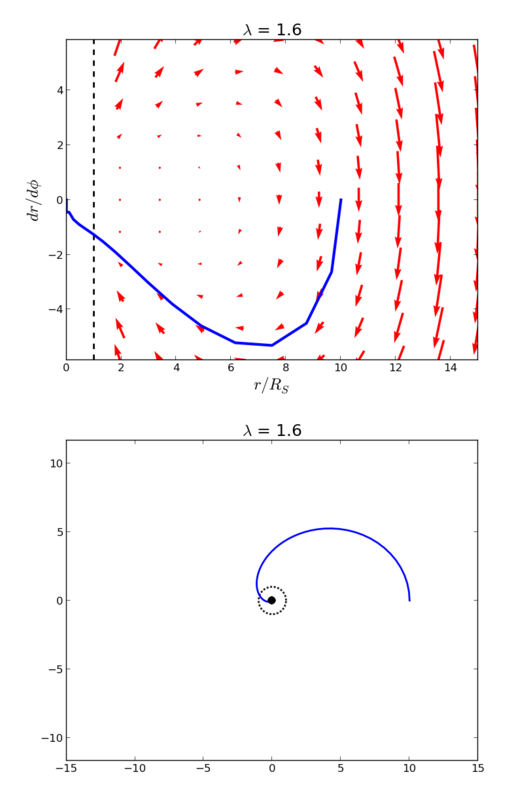 To make everything even nicer, I rescaled both the radius and ℓ That leaves us with a nonlinear but perfectly tractable differential equation describing the motion of an object near a black hole: This equation is the basis of the plots above. Technically, physicist Karl Schwarzschild did not find the solution that bears his name. He found his Massenpunkt solution in an earlier, incorrect version of general relativity shortly before his death in 1916 from a disease he contracted during World War I. See K. Schwarzschild, “On the Gravitational Field of a Mass Point According to Einstein’s Theory”, Gen. Rel. and Grav. 35, 951–959(2003). DOI: 10.1023/A:1022971926521 . Translated by S.Antoci from Über das Gravitationsfeld eines Massenpunktes nach der Einsteinschen Theorie, originally published in Sitz. Kön. Preuss. Akad. Wiss. Berlin, Phys.-Math. Klasse (1916), 189–196. For more about phase portraits, see my earlier posts on pendulum motion. For a lot more information, I recommend reading up on nonlinear dynamics! See Steven H. Strogatz, Sync (Hyperion, 2003) for a non-mathematical approach or Nonlinear Dynamics and Chaos (Perseus, 1994) for a technical overview. I used the latter extensively in this post preparation. My essential book for general relativity is Gravity by James B. Hartle (Addison-Wesley, 2003). It’s a very physics-oriented approach on the undergraduate physics or math level. Even though I have a PhD and did a lot of high-level work on gravity, I still think this is the best reference for thinking clearly about gravity.